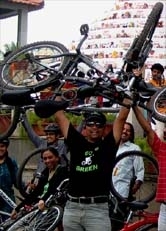 GoGreen Campaign Ride towards BSK-II Stage 09 Jan 11 - GGI-Group size: 4000+ Professionals, Increasing on day to day basis, Come & join us 2 serve Mother Nature. @ a very famous hotel by name SLV. The IVC food was awsome. Cubbon Park - Kasturabha Rd - U trun @ Jewles de Paragon - Kanteerva Stadium - Hudson Circle - Urvasi Theater Rd - Lalbagh West gate - Bhanshkari Road - BSK-II stage BDA Shopping Complex and dispersed. Recently passed out post graduation in life science (Microbiology) at Bangalore University and planning to do doctorate in future. He always tries to achieve something new. 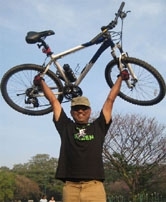 His other interests include trekking and long distance running (Marathons). He lives with the principle “you can do, if you can’t do no one in this world can do”. 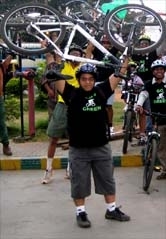 Go Green Team @ Cubbon Park Central Library.